Part Four: In Between M.Sc. and Ph.D.
My last day in Paris started last night. I had some plans for Saturday night that I had planned during the day while out and about meeting people, however these plans were tenuous at best. I was at home to greet India’s sister, Dora, who was arriving from South France, and it turned out that she had a friend, who had a friend, who was having a birthday. She invited me to this and so I went to the birthday party of a friend of a friend of the sister of a friend around midnight. I had no expectations, and we were both tired from our mutually long days. It was a windy and warm summer Parisian night on the 7th story of a building on Cite du Chapelle. The wine was something amazing, with a variety of tastes to choose from. The music was thumping, and the bodies bumping. Most people were actors or artists, or singers, or designers of some type or another. One such fellow, Vincent Macaigne, I later found out is actually quite famous. He was interested in astronomy, and so I told him of the wondrous Leiden University. At some point I recall talking avidly with a classy lady who was 55 and who had moved to Paris for love at 25 from a little town north of Montreal. She was alone now, and had a sadness about her. There was also a very interesting person I talked to at length, who was able to speak in sign language. I learnt a few words. At some point some amazing homemade cakes came out. The night degraded slowly, and I was very tired this morning. I had a late brunch of hamburger and chips in the trendy urban quartier de Bastille, which reminded me a lot of Dundas and Queen West of Toronto, and then took a little nap in the evening. India arrived back from her beach weekend with colleagues, ever so slightly the shade of cooked lobster. I idled away the rest of the evening programming on the balcony in the breeze. 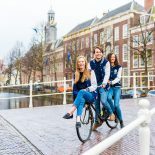 This entry was posted on July 5, 2015 by in Student Life and tagged Art, Birthday, leiden university, paris, travel.